ProSlat's 4 in Double hook (package of 3) is designed to hold rakes, shovels, brooms and tools. It is made of heavy duty high grade welded steel with rubber cushion - great for organizing your garage or shed. 3 pack - a multi-tasking hook that's useful for hammers, shovels, sports gear and more. The Husky 4 in. Track Wall single hooks is an essential companion to the Husky Track Wall Storage System and is made of high-quality powder coated welded steel. This multi-tasking hook is convenenient for storing hand tools, gardening supplies and other items . The sturdy back plate is easy to re-position within the track, making the the task of organizing your garage easy. Simply clip the back plate into the track and slide along the hook channel to re-arrange as often as you like. Each 4 in. single hook has a load bearing capacity of 15 lbs. with an easy to clean, powder coated, black gloss finish. Wall Storage Solutions, 4-in double hook - 3 Pack ProSlat's 4 in Double hook (package of 3) is designed to hold rakes, shovels, brooms and tools. It is made of heavy duty high grade welded steel with rubber cushion - great for organizing your garage or shed. 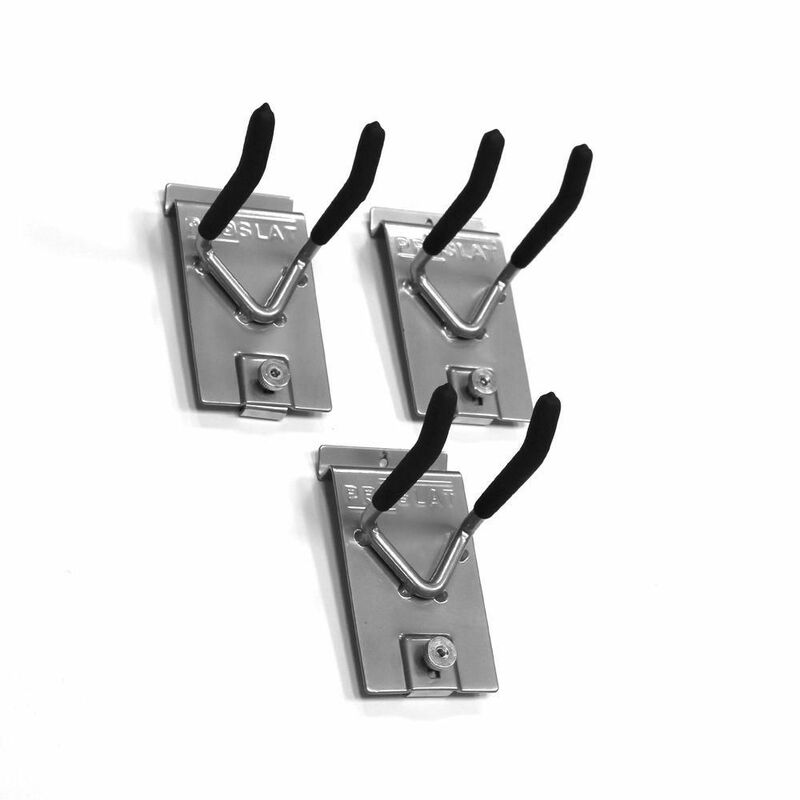 Wall Storage Solutions, 4-in double hook - 3 Pack is rated 5.0 out of 5 by 2. Rated 5 out of 5 by Drew from Great final product. HOME DEPOT should be carrying these products in their store. Great final product. HOME DEPOT should be carrying these products in their store.